Orange Mittai is actor Vijay Sethupathi's maiden production venture releasing worldwide on the 31st of July. This film, written and directed by Biju Viswanath, will feature Vijay Sethupathi in the lead role alongside Ramesh Thilak, Arumugam Bala and Aashritha. Justin Prabhakaran of Pannaiyarum Padminiyum fame takes care of the music department. 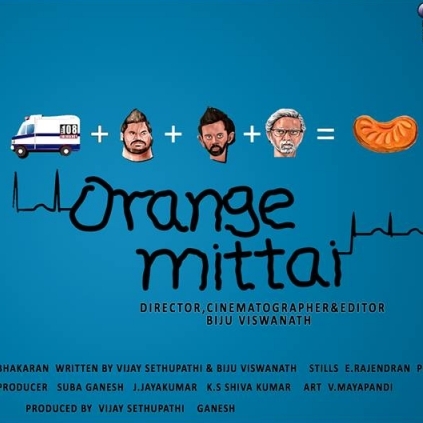 PRIME Media in association with Sigaram Visual Media will be releasing Orange Mittai in the USA in all the main locations like San Jose, New Jersey, Dallas, Chicago, Virginia Seattle, etc. Superstars to come together for Puli ? People looking for online information on Biju Viswanath, Orange Mittai, Prime Media, Vijay Sethupathi will find this news story useful.